I get such a thrill out of creating something functional that is also decorative. 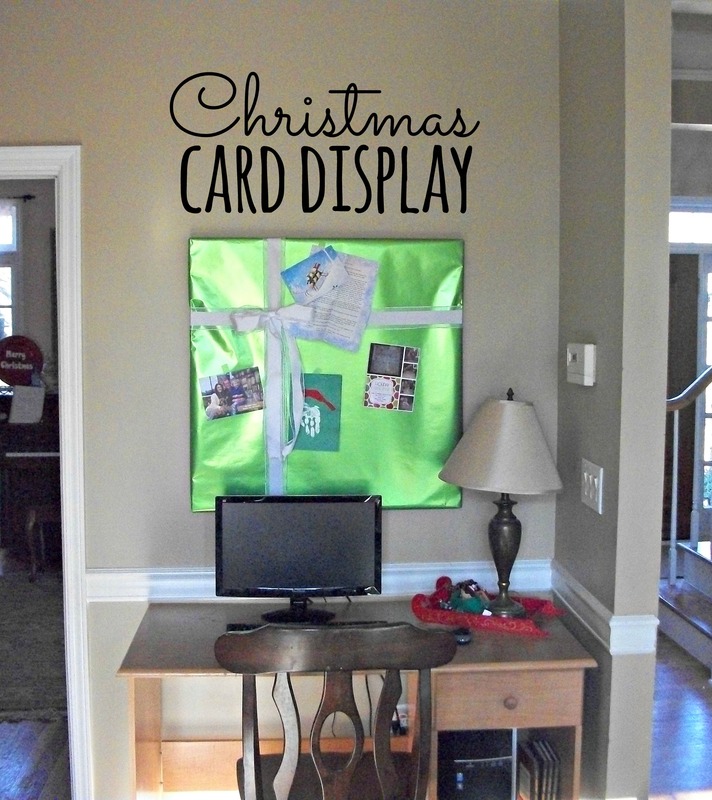 Today I want to share an easy way to create a Christmas card display that uses what you already have! There are a lot of Christmas card display ideas that involve shutters, wire, clips, etc… they are really cute, but in my house, I don’t have extra wall or floor space to put up a display like that. I’ll show you how I cover a picture that is already on my wall and turn it into a place for Christmas cards. Above our computer station in the living room is this very large print that is one of my husband’s favorite pieces of art. A great trick for Christmas decorating is to wrap your frames like gifts. I take it one step further and use that wrapped frame as a place to tape up all of the Christmas greetings. I’ll share a few tricks to get this to work. First of all, I recommend using wrapping paper that is a solid color. If you want to do a print, it is really best to go with a simple one – maybe a geometric print. Since my house colors are very bright and vibrant, my Christmas accent color is lime green, and that is the color I chose for my wrapping paper. If you have a very large frame to cover, it is likely that your wrapping paper is not wide enough. With some careful placing of the seam, you can get this to work just fine. Wrap as much as possible of the frame, leaving enough to just fold over and tape to the back. If you look closely, you can see where I have taped on the wrapping paper from past years. Next, you will want to place the edge of the second sheet of wrapping paper where you can disguise it with a ribbon. I chose about 1/4 to 1/3 of the way in on my frame. If you like, you can use a little roll of tape to hold the paper in place while you flip the frame over and tape it down in the back. Once the wrapping paper has been taped on the frame, you can add in the ribbon of your choice. Again, I wanted to keep the colors simple since by the end of the month it is going to be covered in Christmas cards. I cut my ribbon into two strips – each strip long enough to stretch across the frame with enough extra to tape to the back. I recommend adding the horizontal ribbon first. The bow works best if you attach it to the ribbon that is vertical. That way the weight of the bow works with gravity instead of making your horizontal ribbon sag. I made a regular bow and then attached it to the ribbon with a safety pin. Of course, you could make any kind of bow that you like! Since I do this same treatment every year, I save these ribbons and store them with my Christmas decorations. The wrapping paper really can’t be salvaged from year to year. Hang it right back up where it was before. As cards arrive in the mail, I just attach them with scotch tape. If you have been looking for a way to showcase your Christmas cards but wasn’t sure where to do it, consider this method – it works great!